So when? Ah... I've missed the first question ;) I wanna ask how do you send out or publish your posts on your blog? I know... You just push the publish button and it goes public. I mean, how would you decide which time is best for your post to get published. Hmm... You might be writing your posts and publish it rightaway when you are done with all sorts of editings. Or you might complete your posts and publish when it's the day or time to pubish. Else, probably you may follow either of ways depending on the content you gonna publish. Now can you tell me your secret? I've been hanging around with blogging friends online for quite time and though I didn't spend 10 years in blogging or went to see when they publish posts, I have made some observations. ● Some bloggers just write at their will and publish the post rightaway. ● There are bloggers who stick to a schedule on their blog and they publish their posts when the time is ready. ● Another group of bloggers follow a schedule, but if they found a timely topic which can grab more attention of the audience, they publish them soon after finalization. Sometimes your posts need to be published when the time is ready as it has a time sensitive content or you need to think how to make use of your time effectively with blogging without being stuck with what you have been doing all the time. Can you come out of your old habits? For example, imagine you gonna celebrate the birthday of your puppy on next Sunday and organize a giveaway for your readers on the same day. So you need your post to be published on the exact date without any error. Would you count the dates, hours, minutes and seconds and be there when it's time to push the button? I know you are dedicated. But let's explore some more. ○ If you are already following a schedule on your blog, then what if you can schedule your written posts to go out when the time is ready without waiting for the right time to push the button? Don't you feel you are taking more effort to publish than write your content? Just think. Here's something I wanna share with you. As I write my blog posts in advance most of the time, I wanted to publish a specific post on a specific day. You can imagine how curious I would be. But when the time is ready, my Internet connection was acting weird and couldn't be online for few hours. I missed it, though I well planned and everything is ready to go. You need to think about risk assessment sometimes. Now take few moments to think about how you would react for such a situation. It's nothing to do with either you are a well organized blogger or it never happened before. My question is, what if it happens? Do you have a second plan? No matter what type of blogger you are and how you decide when to publish your posts. If you are on Blogger, you are safe as the Schedule feature is there for you :) Yeah, you can schedule your posts when it needs to get published and it will be posted automatically without waiting for you to be presented to push the Publish button. I was always looking at the clock and waiting to push the button and I didn't know how much time I'm wasting with the excitement of waiting for right moment. It may be alright for once or twice. But since I got to know about the capability of scheduling posts, it was taking care of publishing and I can say it's busy enough with scheduled posts right now. Even this post is on the schedule. It doesn't matter if you are not on the Blogger platform. But think and research how you can make use of scheduling on your blogging platform too. That will save you and might redefine your blogging experience. 3. If you are planning to schedule a new post, start writing your post by clicking New Post button. Else if you already have a post in draft and wanna schedule it, then navigate to Posts tab on left and click Edit link correspond to your draft post. 4. Now find Post settings at right sidebar and click on Schedule setting. 5. 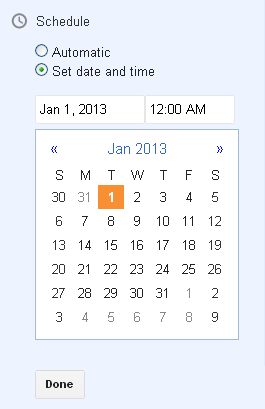 Switch to Set date and time option from Automatic option and set the date and time for your post to be published. 6. Now click Done button to confirm. 7. Click Publish button above the Post Editor like when you publish a post and it will be scheduled according to your settings instead of publishing rightaway. 8. Now you can see your post with Scheduled status at the Posts tab with count instead of in the Draft tabs. * In case, if you wanna change the scheduled date and time, then click Edit link correspond to scheduled post at Scheduled pane and click Publish or Schedule button after changing the date and time at Post Settings. * If you want your scheduled post to get unscheduled, click Edit link corresponds to your post at Scheduled tab and click on Revert to Draft button. Important topic of discussion Mayura! To be very honest, I really haven't started scheduling my posts and keeping them in Wordpress,, as we have an option like Bloggers to store our posts too. I guess I just end writing them one or two days in advance. However, you are absolutely right that we need to scedule them well in advance so that we take care of those times when due to various reasons we are caught up with work or emergencies and can't post on our blogs. I have been through such times, but yet need to learn my lesson. :( Yes, I do have other writing projects and I tend to get busy with those soon after putting up a post, so everything tends to take a back seat - but there are no excuses for doing what's required - isn't it? So, thanks for sharing this and reminding me about it. As you pointed out, it's true that even scheduling is available for blogging platforms, still we tend to be there for it. We can be busy enough at the moments and obviously an emergensies can pops up. Just take first step and you will conquer another fear this year and find another way to manage your time effectively :) I hope you will do dear. Most of the time I write a few posts in advance and then schedule them into my wordpress to be published on the days I normally post, I post 2 times a week and I can set them to do this and forget, this gives me time to get my other tasks completed. I find this works well as things can crop up that would prevent me from writing a new post and getting it published, it is important to keep to a regular schedule as my readers know what days to expect a post on my blog. Thanks for sharing this, hope you have a great day. Again a new unread chapter! I have never thought of doing this but now I know the importance of doing this. I hear ya dear ;) I believe it's as a smart move and an efficient usage of the technology. That can save you from lot of troubles if you have to deal with more tasks, right? :) Glad to know you have been doing it and found it productive dear. Now that can help when things go busy for us, no? :) For me, this month is about scheduling. Thanks for coming over and sharing with your blogger friends Brenda :) I hope that will save some time for bloggers. Your article is very exciting and informational. I am trying to post on my blog as mentioned in your schedule and this has helped me with one aspect. Thanks for sharing this great information. Hello Mayura, great tutorial I'm sure some of those Blogger users will find this very helpful. I see you like writing a lot of tutorial? they come in very handy so keep rolling them out my friend. Have a great weekend. I am using wordpress and have sometimes scheduled to post, but most I just edit and post on a day that seems about when I need to. If I ever get in a bountiful of posts ahead of time it would be great to schedule them for down the line. Some super good information to think about and shall have to keep this in mind when the time arises for my next posting. Yeah, I do love writing tutorials and as and when I find something helpful mate :) We all do learn and share, right? Well, without overwhelming readers and myself though. Ah... You can try it few times though it doesn't need to schedule Mary :) You might find you are saving some more time, of course, waiting time ;) Well, try it out dear. As you know, I use WordPress and tried to schedule my post a few times, and guess what, they never posted. I don't think this was operator error either. :D I'm not sure what was going on, but ever since then, I have to wait for the exact right minute to push the button. It does get old, too, but I don't trust that m posts will be published on time. Maybe there is a plugin I could use to solve this problem, I'm not sure and haven't taken the time to look into it....maybe Blogger is the answer? haha. Thanks for another interesting and useful post, Mayura! Hello my friend and teacher! Because I am blogging more often these days this is the perfect way for me to have things under control. I was just talking about this to a friend that uses this system. With more blogging, and building a community site and webinars with my husband, I'm finding that my time is limiting. I have been using a system for my email list and why not my blog. Life happens! There are times where my internet can go down, an illness can set me back etc. I found the perfect answer to my question before I even asked it. I thank you once again Mayura! And I DO consider you one of my best teachers. Very nice article and useful topic.Everything doing by ourself is so hectic so by using auto pilot mode for publishing can be great help.As i submit in 3 days so prefer to publish as it completes, some time i use live wire for auto pilot mode for publishing my article. Thanks again for sharing the information and knowledge with us. Yet another very helpful post from you, Mayura. lol :D You don't wanna change the blogging platform for that. Hmm... Might be something with the setting up I guess. You can find more information about it here Jess ~ Schedule a Post - WordPress. Ohw so you are publishing as it completes :) I know there are different ways that bloggers prefer and if you have to away for few weeks from your blog, scheduling can be your life saver, right mate? :) It's been mine for this month. Haven't head about Live Wire though :) Something to touch on. Mayura, this looks like an updated version from the last time I scheduled one on blogger. Interesting, Thanks for sharing another tip with us. Thanks for sharing this, Mayura. I schedule my blog posts on my main blog on M - W- and F mornings. Then on my lesser blogs, I schedule them on M, W, or F mornings but I don't do a three a week on the lesser blogs. I like knowing when they are going out as it makes it easier to syndicate them and pin to pinterest from all of them at one time. Works for me anyway. Thanks! Hi mayura, thnx for such a nice post. i just started a blog and publish my post in same way u mentioned in this post. i write my articles in advance and publish them on correct time. That's wonderful to hear that you have been writing posts in advance and schedule at right time :) That's a good habit and will save you when time is restricted. I've seen you over at couple of places I visit too mate :) Glad to see you here too. 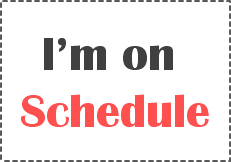 Absolutely scheduling can help a lot and it has been helping throughout last month as I had no chance to write posts mate :) They all have been scheduled. Time is precious for bloggers. Isn't it? Thanks! I had no idea that I was supposed to hit publish after I scheduled the post. Yeah, it's better if the button label was "Schedule" instead of "Publish" :) Anyway, now you know about it.